Philadelphia Eagles quarterback Carson Wentz explained one "lie" about the Christian faith that Satan wants people to believe while sharing his faith at a live event held at Eastern University in Pennsylvania last week. The 24-year-old Wentz, who is in his second season with the Eagles after a successful collegiate career at North Dakota State University, appeared at a special live event last Wednesday hosted by "Faith on The Field" radio show broadcasted on Philadelphia's 610 AM. Although the event was held outside in the rain, over 2,000 people attended the free event. Wentz, along with Eagles tight end Trey Burton and offensive lineman Stefen Wisniewski, was interviewed by the show's host, Associated Press sports writer Rob Maaddi, and his co-hosts. Considering that Wentz grew up as a Lutheran but is now a non-denominational Christian, he was asked during the show, which will air on the radio Monday, to explain where he currently is in his faith. Wentz went on to talk about the lie that a lot of Christians believe and one that he admitted falling into the trap of while growing up. "I think talking specifically about that and being saved by works is obviously a lie, but it's a lie that a lot of people believe. It's a lie just in our culture. I know for me as a man, even when I was a kid, with sports and anything I did, I was going to work my tail off to earn what I got. That's how I was wired, that's how the world kind of instills this value, so to speak, is work, work, work, and earn it," he said. "And that's kind of what I thought. I'd pray, I'd go to church, I'd do this and that, and I'm like that's great, I'm a good person, I did the right and so I'm going to be saved naturally. That's what I thought," he added. "That's the lie that the devil wants you to believe." Wentz also shared the Bible verse that really changed his perspective of salvation. "Ephesians 2:8-10 — 'For it is by Grace that you have been saved through faith — and this is not of yourselves, it is the gift of God — not by works, so that no one can boast. For we are God's handiwork, created in Christ Jesus to do go works which God prepared in advance for us to do,'" he recited. "So, when I learned about this grace and learned about how my view of Christianity was really just flipped on it's head, because you see, Christianity is the only religion in the world that you can't earn Heaven, you can't earn an afterlife, you can't earn reincarnation or whatever it is that other people believe." "Christianity says it's done; Jesus already did it. He took it all for you and this is what Paul is saying here in Ephesians," Wentz continued. "He's saying it's by grace alone you've been saved, not by works so that no one can boast. I mean, he can't lay it out much clearer. Then he says, 'But we are God's handiwork, created in Christ Jesus to do good works.' See we're not saved by our actions but our actions come out of our faith." According to Wentz, the notion that people are saved through works and not a relationship with Christ is a "misconception that a lot of people have." "I think it's a daily thing. I know for me, we get caught up in doing good, doing good, doing good. That it's a daily thing for me to just remind myself like without Jesus in it, I can't do it," he added. "I can't earn my way to Heaven and nobody can. So, I really challenge every one of us to just [have] daily kind of have that perspective because it's so easy to get caught up in doing good and thinking that I'm good enough, but without Jesus, none of us are.'" Wentz has not been afraid to share his faith on Christ on social media and with others. In the interview, Wentz was asked to explain how he handles criticism he faces for expressing his faith publicly. "Jesus was murdered on a cross. I mean it doesn't get much worse than that. In that day and age, it doesn't get anymore humiliating and embarrassing than that. And so, I'm like, if Jesus, who is our ultimate example, endured that, then I can endure a couple tweets, I can endure a little riff raff here and there," Wentz said. "I can keep that out and stay true to His Word because at the end of the day, I can stay true to that, and Jesus is ultimately, the example." "If you love something enough, you're going to talk about it — if you love your wife, if you love your job, if you love whatever it is that you're passionate about, you're going to talk about it," he added. "If you love Jesus, you should talk about it. You should tell the world about Him, you should share that truth. And so, there's going to be persecution, there's going to be haters, you have to just stay true to Him and ultimately that's what it's all about." 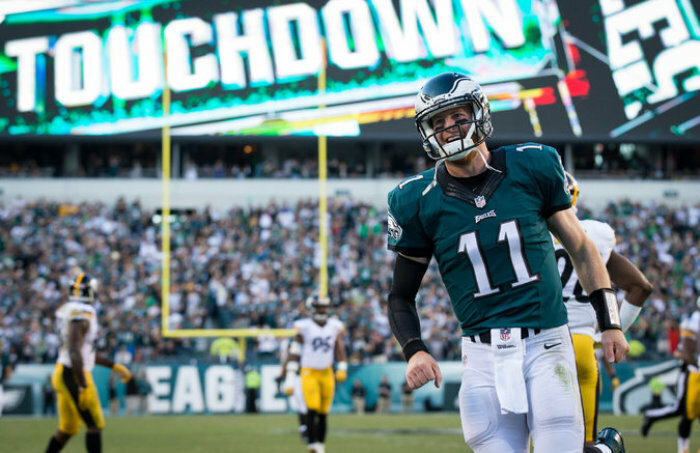 Wentz founded the AO1 Foundation earlier this year, which exists to "demonstrate the love of God by providing opportunities and support for the less fortunate and those in need." The organization not only cares for the poor, but also provides unique opportunities for the physically challenged and also provides service dogs to youth in Philadelphia. "It's a cool platform and opportunity to just really make a difference overseas, back home in the Midwest, and then also in the Philadelphia area," Wentz said during the interview. "I encourage you to go check that out and see if God puts it on your heart to make a difference in that area." Earlier this year, Wentz, along with Buffalo Bills receiver Jordan Matthews, went on a missions trip to Haiti. "We only went for three days, and you know everyone always goes on these mission's trips and [is like] 'I'm going to go change the culture and go make a difference there.' It's an incredible thing and an incredible opportunity, but what really happens is it changes you. It changes your heart, it changes your life, it changes your perspective in a big way," Wentz emphasized. "This was my first mission trip, my first eye opening event like this in my life."